Anales Inst. Biol. Univ. Nac. Mexico 25: 214. 1954. TYPE: Mexico. Chiapas: Las Vistas north of Berriozabal, 1,250 m elev., Miranda 6707 (MEXU, holotype). Terrestrial on rocky, steep slopes to 0.6 m tall; stems 10 cm long, 1.5-3 cm diam. ; leaf scars ca. 1.5 cm wide; roots ca. 5 mm thick, directed downward; cataphylls subcoriaceous, 3-5 cm long, acute at apex, the acumen minutely apiculate, drying light brown (B & K Yellow 4/5), persisting intact at apex, splitting into linear fibers at base. LEAVES erect to spreading; petioles 13-56 cm long, 3-7 mm diam., subterete, weakly flattened adaxially; geniculum 1.5-2 cm long broadly and shallowly sulcate; blades triangular, acuminate at apex, broadly lobed at base, 12-33 cm long, 11-23 cm wide, broadest at base; anterior lobe 9-16 cm long; posterior lobes 12-18 cm long, directed outward; sinus triangular to parabolic to sometimes hippocrepiform; upper surface semiglossy to glossy, lower surface semiglossy, the midrib convexly raised above and below, diminishing at apex above; basal veins 4-5 pairs, the first and sometimes the second free, second to fourth coalesced ca. 1.5 cm, third to fifth coalesced 2.3-4 cm, raised in weak valleys above, raised below; posterior ribs curved, naked, the outer margin upturned; primary lateral veins 4-5 per side, departing midrib at 45°-50° angle, raised or flat above, raised below; collective vein arising from uppermost basal vein (sometimes with lower basal veins loop-connecting to the collective vein), sunken above, raised below, 6-10 mm from margin. INFLORESCENCE spreading to erect, shorter than the leaves; peduncle 16-40 cm long, 2-4 mm diam., terete, sometimes tinged with violet-purple, longer than the petioles; spathe medium thick, green tinged with purple at margins, lanceolate to oblong-lanceolate, 4.5-9 cm long, 0.9-2.7 cm wide, broadest at base, acuminate at apex, clasping to truncate or rounded al base, inserted at 45°-60° angle on peduncle; spadix green (B & KYellow-green 5/7.5), 5-10 cm long, 7-9 mm diam. at base, 2-3 mm diam. At apex; flowers square or rhombic, 3-5 mm long, 3-4 mm wide, the sides ± straight tojaggedly sigmoid; 3-5 flowers visible in either spiral; tepals matte, green, inconspicuously punctate, minutely papillate, tinged with violet at margins, sparse droplets appearing when anthers are open, lateral tepals 1.5-2.5 mm wide, inner margins straight; pistil scarcely emergent, green, densely purple spotted; the stigma oblong, shallow, green, 0.8-1 mm long, opening with minutely exserted papillae, small droplets apparent for 7-10 days, dry and black for 2 or 3 days before first stamens emerge; stamens emerging ± rapidly from the base, the second, third, and fourth stamens emerging soon after leading stamen; anthers brown, held on short filaments that quickly retract, anthers held al edge of pistil but not contiguous; thecae ellipsoid, divaricate; pollen yellow, fading to white. INFRUTESCENCE pendent; spathe withered; spadix to 10 cm long, 20 mm diam. ; berries orange (B & K Yellow-red 7/5), broadly obovoid, round at apex with a conspicuous indentation, 8-11 mm long, 7-10 mm wide; pericarp transparent, somewhat thickened, lacking raphide cells; mesocarp fleshy, juicy, with numerous raphide cells; seeds 1 or 2, flattened on one side if 2, ellipsoid in cross-section if only one, pale green, 6-8 mm long, 4.5-5(9) mm wide, 3.2-3.5(6.5) mm thick. Figs. 16, 17, and 26. Anthurium berriozabalense is restricted to Mexico and is known for certain only from northeastern Chiapas at 1,000 to 1,300 m. A collection from eastern Oaxaca (MacDougall 311) from Río Grande (presumably near Matias Romero) is probably also this species. The forest type near El Bosque where I have collected the species is "bosque caducifolia" and the forest type where it has been collected north of Berriozabal is "selva baja caducifolia." 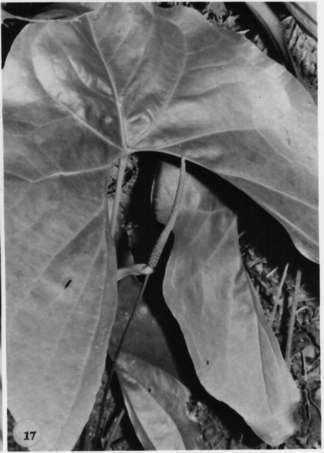 The species is tentatively placed in section Belolonchium and is recognized by its semiglossy sagittate leaf blades with long, slender, posterior lobes that are usually as long or longer than the anterior lobes, and also by its green spathe and spadix and subglobose orange berries. 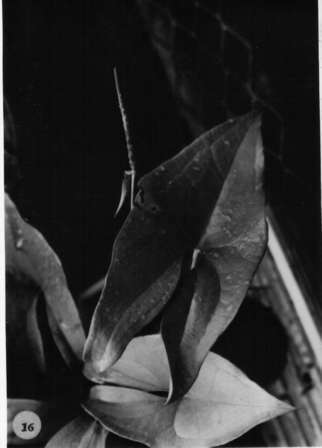 Anthurium berriozabalense is perhaps related to A. seleri, a more wide ranging species whose range overlaps that of A. berriozabalense. Forms of A. seleri with long, slender posterior lobes have been confused with A. berriozabalense but they can be distinguished from A. berriozabalense by the much longer (or at least equally as long) anterior lobes and by the anterior lobe and posterior lobes forming a broad concave edge. In A. berriozabalense. the margin is either straight or convex and the posterior lobes are usually as long or longer than the anterior lobes. In addition, the leaves of A. berriozabalense are thin whereas the leaves of A. seleri are subcoriaceous. Still another difference is that the collective vein of A. berriozabalense usually arises from the uppermost basal veins or has the lower basal veins conspicuously loop-connected with the collective vein. In A. seleri the collective vein arises from one of the lowermost basal veins and extends rather uniformly along the margin of both the posterior lobes and the anterior lobe to the apex. 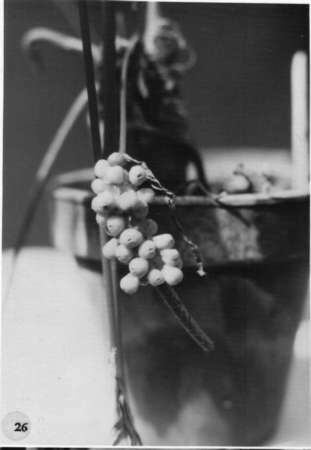 In the type description Matuda discussed the similarity of A berriozabalense to A. umbrosum but these two species are not at all similar except that both have orange berries. Belize Toledo: 15.59N 89.13W, 30 Jan. 1990, Balick et al. 2504 (MO). Guatemala Peten:, 19 Aug 1966, Contreras 6009 (LL). Mexico Chiapas:, , Thomas B. Croat 47715 (B, CAS, F, K, M, MEXU, MO, NY, RSA, SEL, US, VEN). Mexico Chiapas: Canada Honda, 1500 m,, 2 Mar 1990, Garcia, A. Reyes et al. 1705 (MEXU). Mexico Chiapas: El Triumfo, 1500 m,, 2 Mar. 1990, Reyes et al. 1705 (MEXU).